In October 2017, the 23 story Wong’s Factory Building (王子工業大廈) at 368-370 Sha Tsui Road in Tsuen Wan was sold for HK$1.23 billion. 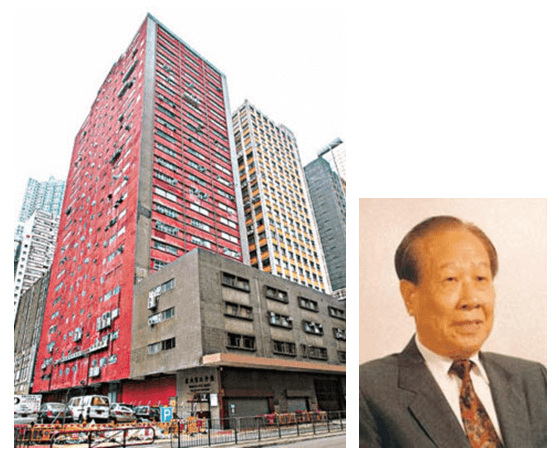 (Building was valued by HSBC at $80-90 million in 2005 according to court documents) Built in 1975, the Chinese name of the building 王子 which means Prince is after its developer – Wong Mee (王美, 1913-2004), who earned the nickname of “the Prince of Garments” as the founder of Sweetmart Garment Works (威馬製衣廠) and Carlo Garment Factory (嘉璐製衣廠), two pioneering garment manufacturers from the 1950s to the 1990s. A native of Toishan in Guangdong province, Wong Mee came to HK at the age of 17 and founded his first garment factory – the Carlo Garment Factory in 1950 (incorporated in 1960 and dissolved in 2017) to manufacture shirts, trousers, pajamas, blouses and children’s clothing. It operated out of 43-47 Shun Ning Road in Sham Shui Po. In 1959, he started Sweetmart Garment Works (although incorporation was not until 1963) to make jackets and raincoats in 71 Hoi Yuen Road in Kwun Tong, which was developed into Wong Tze Building (王子大廈). 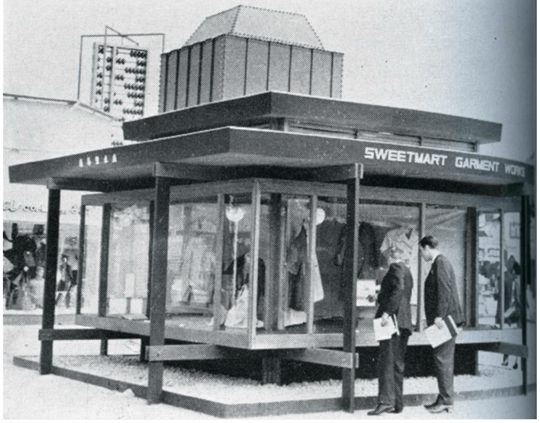 By 1964, Sweetmart had 300 workers and was producing 200 dozens of raincoats and jackets every day. All of its products up to that point were exported with Western Europe being the biggest market and monthly order of 3000 dozens from the UK alone. 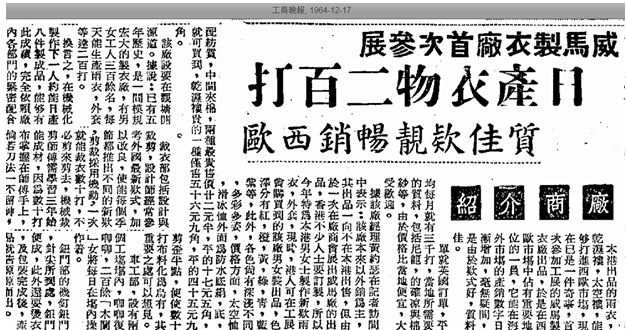 (In fact Wong Mee wrote an article entitled “Great Britain Joining the Common Market and the HK Garment Manufacturing Industry” for the annual report of HK Garment Manufacturers Association in 1962) The firm participated at the HK Products Expo for the first time that year, selling jackets that ranged from HK$17-56. In 1970, Sweetmart entered into joint venture with E&R Inc in Canada and received an exclusive license from the latter to manufacture garments incorporating a feature developed by E&R known as “Evins telescopic sleeve” to meet the requirements of the Canadian Air Force. In the 1970s, Sweetmart and Carlo also entered the production of jeans. In March 1976, Wong Mee moved Sweetmart and Carlo into the newly constructed Wong’s Factory Building, which doubled the production capacity of the firms. At that time, Sweetmart and Carlo took up 100,000 sq ft of space in the building while the remaining 300,000 sq ft were leased out to other factories. As production costs in HK soared, Sweetmart like many other HK manufacturers looked overseas and in the mid-1970s, Sweetmart formed Encore Textile Manufacturing Corporation in Bataan Export Zone in the Philippines in partnership with local Filipino partners. By 1978, the Filipino venture was exporting nylon and woolen jackets and denims worth over $12 million. As China opened up in the late 1970s, Sweetmart opened Kow Kong Garment Factory (九江制衣厂) in Kow Kong, Nanhai in partnership with the local government in 1979 with over 300 machines imported from HK. By 1982 the plant had over 1100 workers and by 1989, the garment industry in Kow Kong which started with Sweetmart’s Kow Kong Garment had 100 factories with export value of US$10 million. In 1984, Wong Mee donated RMB800.000 to construct a hospital named in his honor in Duhu in his native Toishan (the road next to the hospital is also named after him). Outside of work, Wong Mee was permanent honorary chairman of the Federation of HK Garment Manufacturers and vice chairman of the pro-Beijing Chinese General Chamber of Commerce. His son Joseph Wong Chit-ming (王哲明)joined the family business in the 1960s and by the 1990s, third generation family members Spencer Wong Tze-tim (王子添) and Eric Wong Tze-cheong (王子昌) were also involved in the firm. By 1999, Sweetmart employed 5500 people in Hong Kong and the mainland producing a wide range of outerwear including jackets, ski-jackets, rainwear, shirts and children’s wear that was sold to the US, Europe and Japan on an OEM basis and under its own brand name, isobar. In 2004, Wong Mee died, leaving an estate that was worth over HK$380 million according to court documents. Unfortunately, business turned south in the mid-2000s and a number of creditors filed suits against Sweetmart and the Wong family. Sweetmart was wounded up in 2009 and family holding company Luenmay Enterprise (聯美企業有限公司) which owned the Wong’s Factory Building first applied to change the purpose of the property from industrial to commercial and then sold the building in 2017. This article was first posted on 2nd April 2018.